They [the rings] are wonderful!! They fit like a dream and I couldn’t be any more happy! Thank you so much for all your help, I will be posting rave reviews on all the online sites I can find. You have been great to deal with Tom and I’m so pleased. Again, thank you for everything. I received my beautiful rings today. I am thoroughly impressed. The craftsmanship is superb. It truly has been an honor working with you and your team of artists. Thank you so much and I will be doing business with you again soon. Congratulations on a very nice web site. We are very pleased with the rings. D is now wearing a real engagement ring and liking it very much. Thank you it has been nice doing business with you. Thought I’d put my two-cents-worth in. The rings exceeded my expectations. They are wonderfully done and I feel we have “unique” rings for our lifetime. The diamond is beautiful and the cut and setting work very well. I’m not an expert by any stretch when it comes to diamonds but even without that expertise it’s easy to see the quality of the stone. Thank you again, I’ll be more than happy to recommend Rings Unique to others. We are back home now and wanted to write you right away! Our rings were just fabulous. Although we basically purchased them sight unseen, we are very happy and elated at the quality, design and customization. The palladium is simply beautiful. I hope to send pictures in the next week or two. Our special weekend was precious. Your skill and design work are simply the best! 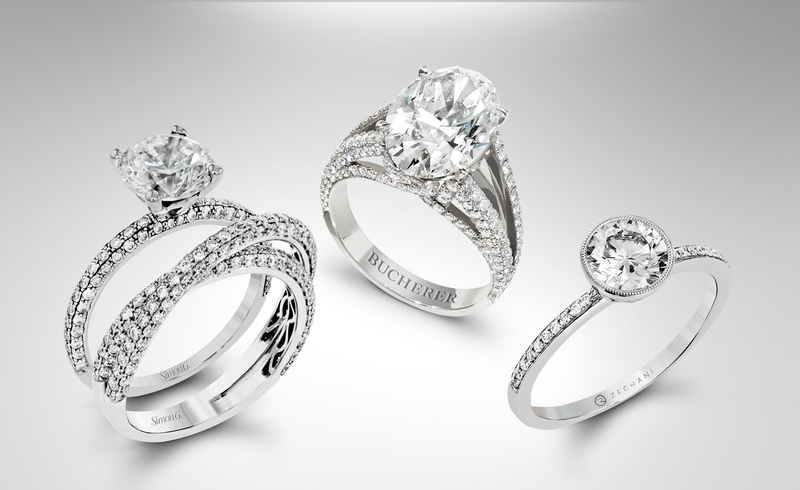 You have captured our imagination of what our rings should be and crafted it into a lifetime of symbolism. The metal is gorgeous and just everything about the design, landscape and placement of the diamonds was perfection. You have an awesome talent! We cannot thank you enough for creating these perfect pieces that we will treasure for the rest of our lives. We also thank you for working with us on such a tight time frame, for your expert advice, and for your professionalism. Thanks so much for overnighting the rings, on a Saturday no less! The rings turned out beautiful, we are extremely happy with them. Thank you so much for assisting us; your customer service has been top notch! I was out of town over the weekend, but yesterday I was able to check my mail. My ring is in, and I love it!!!! Thank you, thank you, thank you. This is an amazing piece of art and it will be forever apart of my life. You and your staff are the best!!! Got the Textures 2 ring this morning and I love it! Fits perfectly and it’s exactly what I thought it would be. Thank you very much and I wish you the best! I am GRINNING. Ring is gorgeous & fits perfectly. You are a genius! Hope are well. We got the rings and she absolutely adores it! She loves it and everything went very well. If you guys want me to author any type of review for your service and work, I would certainly do that. We thank you very much!!! Tom, I received the rings last week. Thanks! They look just amazing together and they fit perfectly! I have really enjoyed the process of doing business with you. I truly believe that love is contagious and I enjoyed sharing our love with you probably as much as you enjoyed sharing you and your wife's love with us!! See it is true "love is all you need!" and the Tree of Life rings sure do symbolize it beautifully!!! The engagement ring is magnificent, and dealing with you was always very straight forward as well as pleasant, particularly since I truly believed that you had our interests in mind. I will be back in touch when it is time for our wedding bands. One of your artists created the most BEAUTIFUL wedding band for my husband. Our wedding was just about a year ago. Your service was incredible. Not only did you put a rush on the ring (my husband was a little slow in deciding what he wanted), but you also sent the ring directly to us at our wedding site in Squaw Valley, California (Lake Tahoe). The ring was part of the Tree of Life Collection, and my husband continuously gets compliments on how unique and attractive the ring is. I want to thank you again for being so wonderful. This is such a special piece to us, and you made the experience truly joyous. Thank you, thank you! Hello Tom. I just wanted to let you know the ring I ordered for Adam is beautiful. He loves it and finds wearing it a pleasure. (That's a lot coming from a guy who doesn't wear any jewelry and never has.) Our wedding day was all we could have imagined and more! It was perfect. And everyone loved his ring and wanted to know lots about it since nobody had ever seen anything like it before. I think it was a bigger hit than my diamond! 🙂 Again thank you for the beautiful, very personal wedding band. I received the ring in the timeframe you stated, and it arrived in great condition with no issues. The fit is perfect, it is extremely comfortable, and I wish I could wear it now but will just have to wait another month. I am extremely pleased with the amazing craftsmanship. I cannot wait to show my fiancee and have this be part of our life long bond. Thank you very much for providing the proper guidance during the process of selecting the ring. I will definitely recommend Rings Unique to anybody who is looking for a special, well made piece of jewelry. I look forward to doing business with you in the future. Thank you!!! IT ARRIVED AND IT'S JUST AMAZING. Everyone at my office is oohing and awing over it. May 9th just can't come soon enough. THANK YOU, THANK YOU, THANK YOU for everything!!!! It knocked his socks off! Tom, the ring is awesome in every way! I was looking for something bold and unique, and I couldn't be more pleased. It's a true work of art, and very comfortable.